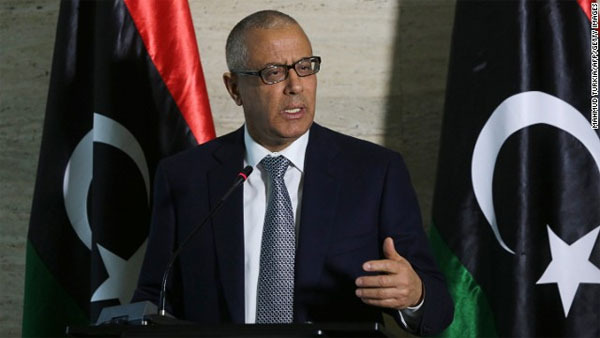 Tripoli, Libya (CNN) — Libya’s parliament voted Prime Minister Ali Zeidan out of office on Tuesday after months of political infighting that has crippled the North African country. The vote of no-confidence came after rebels in eastern Libya said a tanker loaded with oil from a port under their control escaped a naval blockade and moved into international waters. The Libyan government said late on Monday that it had taken control of the North Korean-flagged tanker, Morning Glory, as it tried to leave the Al-Sidra port in eastern Libya, and after having briefly exchanged fire with rebels. However, in a sign of the chaos and conflicting information typical for Libya, the rebels rejected the assertion. Oil production, Libya’s economic lifeline, has slowed to a trickle since the summer as armed protesters have seized oil ports and fields to press political and financial demands. They are seeking a greater share of the country’s oil revenue, as well as autonomy for eastern Libya. The conflict over oil wealth is stoking fears Libya may slide deeper into chaos as the fragile government fails to rein in the armed brigades that helped oust Moammar Gadhafi in 2011 but now do as they please. The removal of Zeidan, a liberal weakened for months by infighting with Islamists, deepens the turmoil in the country of 6 million people. However, a crowd outside the Tripoli hotel where lawmakers had met to vote could be seen cheering as news broke of his dismissal, images broadcast on Libyan television showed. “We have nothing personal against Zeidan, but his government has failed the people,” one man said. Zeidan will be replaced temporarily by Defense Minister Abdallah al-Thinni, who will hold the position of premier for two weeks until a replacement is picked. He was sworn in after the vote. Libyan state news agency LANA said the General National Congress had passed the dismissal with 124 votes; it was not immediately clear how many of the nearly 200 lawmakers were present during the session. Previous attempts to bring down Zeidan, who has headed the government since November 2012, had failed to win the required majority. Zeidan was himself briefly abducted by former rebel militia in the heart of the capital Tripoli last year. He had for months been facing rising opposition from Islamist parties and the wider public, blaming his government for the rising violence in the vast desert nation. Corruption and a multitude of other problems Libya is facing in its bumpy transition. At the same time, anger has been mounting against the GNC after it extended its term in office, which was supposed to end on February 7. Angry protesters earlier this month stormed the GNC headquarters — ransacking it, assaulting some members and wounding two others while shooting. Tripoli had entrusted militia leader Ibrahim Jadran to safeguard some crucial oil ports. But eight months ago, he and his men seized them, blocked oil exports, and demanded more autonomy and shared revenue for his eastern region. The blockades have led to a slump in crude production — with output said to be around 250,000 barrels per day, down from 1.6 million. Libya’s government has threatened force against ships that entered the rebel-controlled oil ports on several occasions. But despite ultimatums to such ships, those deadlines came and went with no action from Libyan officials. Autonomous regional government without the authorization of the state oil body, the National Oil Corporation. It is unclear who actually owns the vessel.